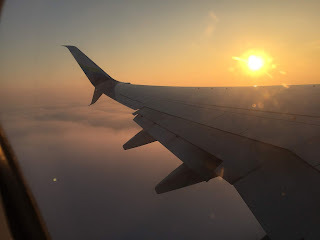 On Sunday, I flew out of Sea-Tac on a flight that took off around 8 AM. The region was covered in dense fog and the horizontal visibility at Sea-Tac Airport was reported at .12 miles (630 ft) at 1453 UTC (7:53 AM)--see below for hourly reports. The sky was obscured, which means the cloud reached the ground. Here was the situation looking out the window while we were on the taxiway. We were in cloud and one could barely see objects a few hundred feet away. We reached the well-lit runway and visibility appeared to be a few hundred feet. As we accelerated down the runway, the visibility seemed to decline. But as we lifted off, we got out of the fog in seconds-- it was only a few hundred feet deep--with bright sunshine above it. A few minutes later, the sky was blue and fog was far behind. The visible satellite imagery at 8:30 AM shows the low clouds/fog, with fog over the lower elevations of westerns Washington...although the Strait of Juan de Fuca was mainly clear. The mountains were in the sun. The fog was capped by a strong inversion, with temperature warming with height. Below is the vertical sounding at the NOAA Seattle Sand Point facility, warming about 8C in 1000 meters. 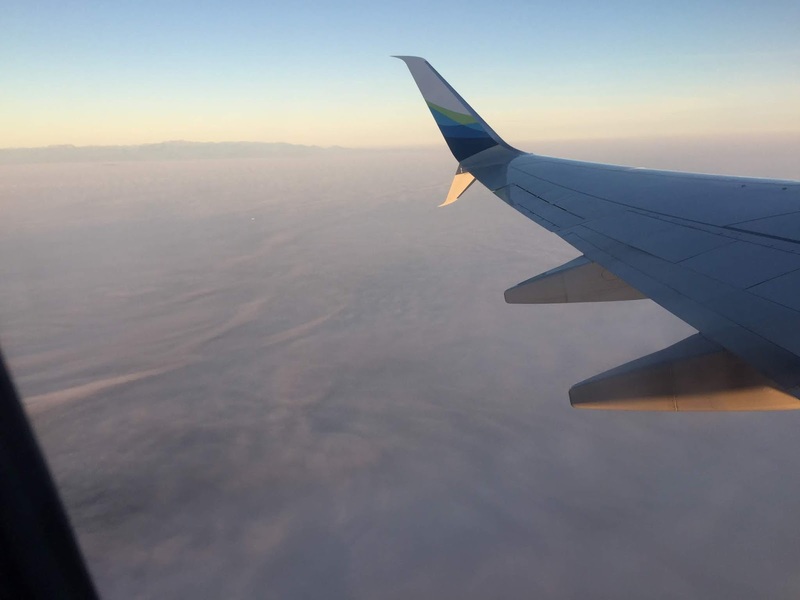 The inversion is caused by sinking (and warming) air aloft, coupled with cooling at the surface or the top of the fog bank. So how can planes take off and land during such terrible visibility? In fact, the arrival/departure board at Sea Tac at 7 AM showed most planes leaving on time, but with several delays (but few cancellations) of arrivals. Thirty years ago, the airport would have been crippled. So what has changed? To get the answer, I asked a friend, Wally Powelson, a highly experienced Alaskan Airlines Captain. He explained to me that there are two main technologies that make such foggy landings/take-offs possible: Head Up Guidance and a technology called AutoLand that takes control of the plane during the critical last moments of flight. Head Up Guidance (HGS) provides a visual display of what the surface and runways look like, even when visibility is near zero. If you want to see what it is like, check out the video below. The AutoLand system takes control of the airplane, using radio beacon signal for horizontal navigation and a highly accurate radar for vertical height. 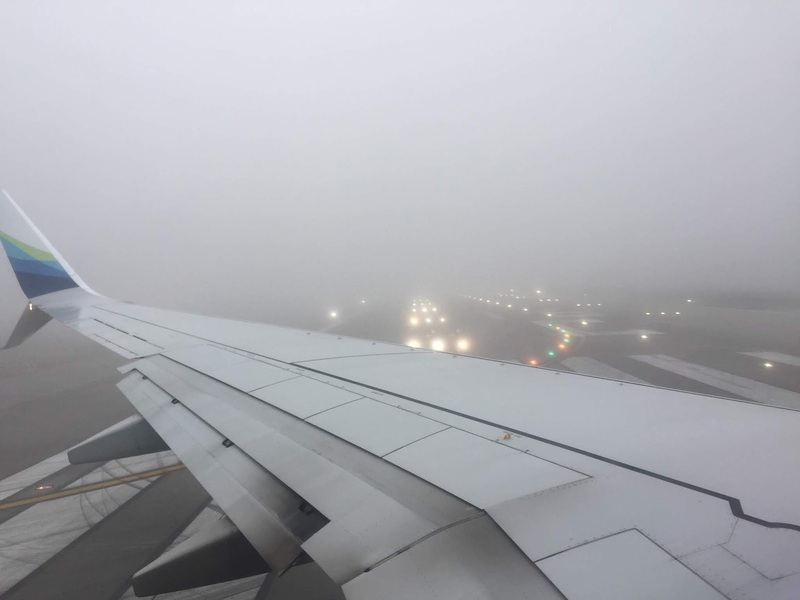 According to Captain Powelson, to take off in fog, a runway with centerline illumination, a heads-up guidance system, and roughly 300 ft of horizontal visibility is needed. 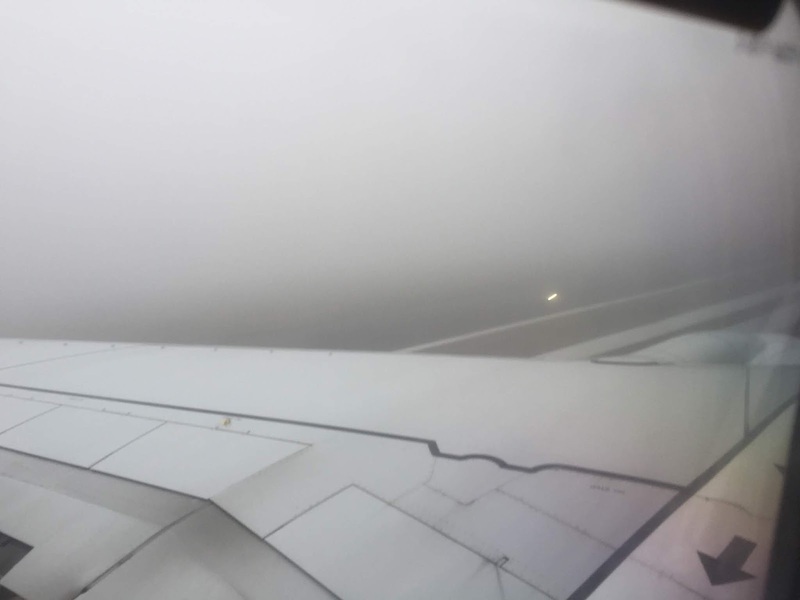 When I took off, they just had enough visibility, and the runway was lit like a Christmas tree. To land, they need at least 500 ft horizontal visibility, the heads-up system, and the AutoLand system. The pilot MUST see the runway when they get down to 30 feet, if not they have to do a missed approach landing and head back into the air. I have been on a few AutoLand landings and they were as smooth as silk. An amazing technology that makes air travel safer and more efficient. And by the way, the fog will soon be gone as winds increase with approaching Pacific storm systems. 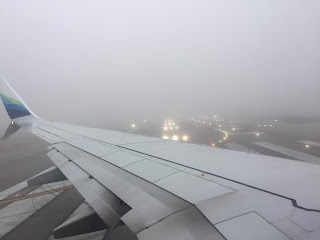 Last December our United flight from Chicago was re-routed to Payne Field due to fog at Seatac. Meanwhile my ride, who was waiting in the Seatac cell-phone lot, kept texting me that Alaska Air planes were landing the entire time. Our eventual arrival? Four hours later at midnight, and we still had a 2.5 hour commute to get home! Apparently many, if not all, of Alaska's aircraft have the AutoLand system. United? Not. As a consolation, United begrudgingly offered me a $75 credit on a future United flight. Uh-uh. That was the last time I flew United. Another radar - related wonder of technology was when they developed a system to predict sudden lightning and wind bursts coinciding with takeoffs and landings at runways. This phenomenon was a huge problem at O'Hare and other airports that experienced storms on a frequent basis. Another very interesting technology is the GPS-enabled systems that allow winding approaches to the runway (where the autoland takes over) is a combination of required navigation performance (RNP) and the plane's autopilot. Alaska Airlines uses it a lot. An interesting example of RNP approaches is Reagan National in DC - the winding path in highly restricted airspace (lots of closed airspace due to security) is very hard for a pilot to follow, but easy for the plane. Nice post Cliff.....but you're seated back with the minions in coach.....no First Class? Cliff, I agree with 'red jetson'. I haven't flown since 1993.You can't have it both ways, ie, support actions to reduce human impact on climate and not except personal responsibility towards that goal. Or maybe you believe like many that buying carbon offsets will somehow reduce your carbon footprint, free you from accountability and allow you to continue leading an opulent lifestyle to the detriment of the planet. I noticed you like to fly a lot. Go for it, but stop pretending. Cliff, I agree with red Jetson. I haven't flown since 1993 and make sure what I purchase is ground shipped, such as my 5KW solar array that powers my home. I'm trying to figure out how you can support action to reduce greenhouse gases and yet don't take personal responsibility for your actions that overly contribute to using the atmosphere as a Dumping Ground? I mean come on, you're burning fuel just to get the mass of that aircraft up in the air, not to mention supporting the carbon footprint and other pollutants of the whole airline industry and supporting infrastructure. You can't have it both ways, lead the opulent lifestyle and complain about human-caused global climate change. 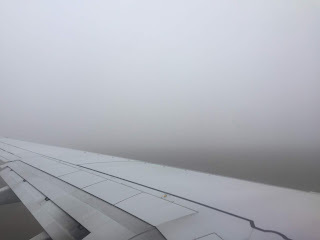 If that October Weather Forklore about October Fog is true, Then we are in for a nice winter" "For Every October Fog there will be snow in winter"
I love flying. Thanks for sharing Cliff. That’s some amazing tech. Cliff: We flew back to Seatac the next day (Monday) from DC-Dulles (IAD), yet the flight to IAD was 5 hours late due to fog at Seatac. Or so we were told. 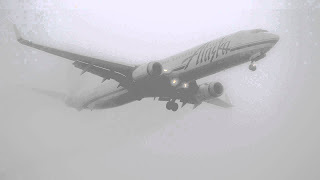 First the Alaska explanation was mechanical difficulties, then they blamed it on the fog. Alaska wants it both ways to cover schedule problems. Didn't get to Seatac til 2 am Tuesday morning, over 5 hours late. Technology needs to work to make air travel safer and more efficient, and the Airlines needs to give accurate explanations why they have delays. Thanks for the explanation about their new systems.